Westerns alternate between sympathizing with the Union and the Confederates in the Civil War. 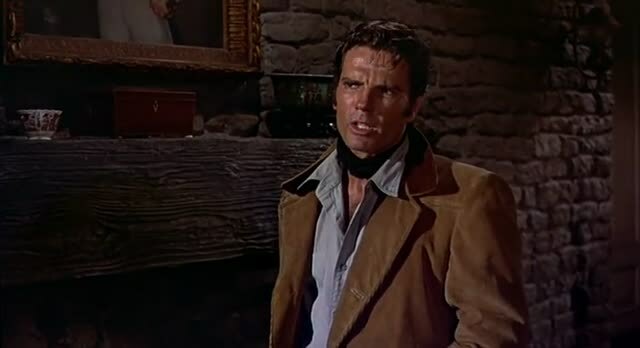 On the whole, I think the southerners come out better more often, perhaps because they make better underdogs, like Charlton Heston here, who returns home from the war to find his ranch threatened by carpetbaggers. Watched it all. I don’t know who the three violent people the title refers to are. This is not a violent western. The violence here is brief – and realistic: The moment the carpetbaggers meet unexpected resistance from Heston and the other Texas ranchers, they flee. Wouldn’t you? Just once I wish a movie that opens with a prisoner who is waiting to be hanged for murder, would stay with the prisoner in the present, instead of going into flashback mode to explain why they’re there. There’s nothing less interesting than why these characters become murderers. But two weeks on death row? Now that would be a movie. Watched: 13 minutes. This entry was posted in 50's movies, Movies & TV on July 16, 2012 by bjoern.staerk.